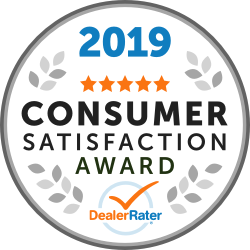 Our Winston-Salem used car dealer is thrilled to have been awarded the 2019 DealerRated® Consumer Satisfaction award. This award recognizes auto dealerships across the country who deliver outstanding customer service based on consumer reviews written on DealerRater.com and enables online car shoppers to instantly spot dealerships that provide high-quality customer service. This award is given annually to the top ten percent of the U.S. new-car dealers based on their PowerScore™ ratings for customer satisfaction, and we at Frank Myers Auto Maxx couldn’t be more humbled to receive this prestigious honor for the third time. The Frank Myers family has been serving Winston-Salem and the surrounding areas for more than 90 years and is proud to say we always put our customers first Instead of focusing on the sale, we realize the most important aspect of the car-buying process is ensuring people drive off our lot feeling confident in their choice of vehicle. We aim to serve our employees, customers, and community by providing complete transparency and offer plenty of financial solutions as we believe that everyone deserves the right to own a newer, nicer car that best fits their lifestyle and budget. We take all of our reviews seriously, and a variety of our customer testimonials from Winston-Salem drivers have offered us great insight into how we can continue to improve and grow as a quality used car dealer. If you’re ready to experience our customer-first approach or want more information about our used car dealership in Winston-Salem, contact us at Frank Myers Auto Maxx. We look forward to helping you into a new ride!